Instead of waiting for grand solutions, huge donations, and audits into on-going corruption, can’t we be a little radical, a little practical, and create an interim solution for a few people? I pass by this cement triangle under the H-1 almost every day. Kapahulu has basically been my “neighborhood” since 2004. During this decade, the underpass has been a complete limbo of ugliness and trash–a space for attacking people at night, a space where pedestrians and cyclists get hit by speeding cars. Unnecessary wasted space. 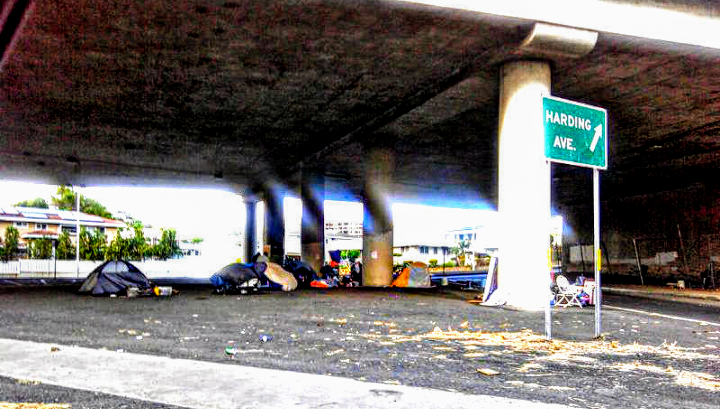 Several times a few homeless persons set up a neat little tent community on this triangle of neglected space. No loud music, no panhandling, no fights. And every time that little community has been ripped away. Why? No more neat little tents. No word where all the people went. People don’t really matter in Honolulu, anyways. I keep making the mistake of thinking that a city is a place for a group of people to live and work and enjoy their lives. All that truly matters is construction and profit and development and profit and profit. And did I mention profit? Well, poorly planned construction created the Underpass Triangle. I see no reason why we can’t temporarily make this wasted space a solution to what is clearly an exploding homelessness problem. Why can’t someone donate a Porta-Potty (or to be civilized, even two–one for women, one for men?)? Why can’t someone else put up a few planter containers with shade plants, and those tough-growing vines that wrap themselves around the freeway support columns like lush green tattoos in a single growing season? Put in a little bougainvillea. Let some quiet people with absolutely nothing but their tents (and food stamps, if they’re lucky) camp out there while they seek other solutions. It’s not like the Underpass Triangle is desirable real estate. Car exhaust comes at you from at least six directions. Traffic noise is never-ending, day and night. Instead of waiting for grand solutions and huge donations and audits into ongoing corruption, why can’t we be a little radical, a little practical, and create a little bit of space as an interim solution for a few people? Baby steps are the only way to start when you’re tackling a problem this huge. I’m sure we can think of a few simple ways that this Underpass Triangle can be used to help some suffering people for a little while, right now. Starting with letting them put their tents back up.